architect; b. March 19, 1807; d. July 15, 1857. Lassus was one of the chiefs of the modern Gothic school in France. He was a pupil of Lebas and Henri Labrouste, and entered the Écoles des Beaux Arts in 1828. Influenced by the general romantic movement led by Victor Hugo, he devoted himself entirely to the study of Gothic architecture, especially that of the period of King Philippe Auguste. From 1841 to 1849 he was associated with Duban in the restoration of the Sainte Chapelle, Paris, and after 1849 had charge of that building. He built the spire (flèche) and cleared away the buildings from the south side of the chapel. In 1841 he won a gold medal in the competition for the tomb of Napoleon I. In 1845 he was associated with Viollet-le-Duc in the restoration of the cathedral of Notre Dame, Paris, and in 1848 succeeded E. H. Godde as architect of the restoration of the church of S. Germain 1'Auxerrois, Paris. Lassus was appointed conservateur of the buildings of the diocese of Paris in 1849, and of the dioceses of le Mans and of Chartres in 1852. He restored the spires of Chartres cathedral. Lassus designed much ecclesiastical furniture, bronzes, and the like. He contributed frequently to the Annales Archéologiques. In 1837 he was chosen to direct the illustration of the Monographie de la cathédrale de Chartres, published under the direction of the Ministère de l'Instruction Publique. He prepared an edition of the Album of Villard de Honnecourt which was completed after his death by Alfred Darcel, and published by the French government. Semper builds the Hoftheater in Dresden (1838-1841). 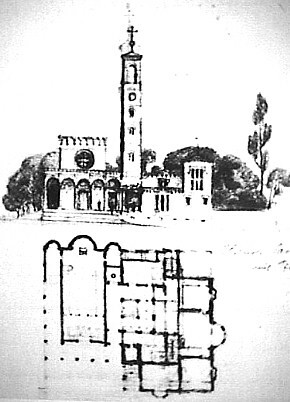 Friedrich Wilhelm IV, Sketch for a Church at Sakrow (c. 1841).